Does anyone have any good info on early Irish shields? I know they were somewhat smaller than the Viking shields, but did they have bosses on them or were they strapped to the arm? 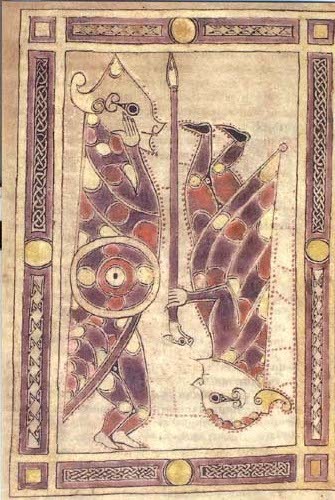 I know The Book of Kells has some depictions of soldiers with shields, but they pictures were to low quality for me to make anything out. Hey Seamus. The high crosses from this time show warriors with shields very similar to those used by the Anglo Saxons and Vikings, only perhaps a bit smaller. How much smaller would be up for debate, as the perspective and scale in the art of this time can be unreliable. A couple of bosses have been found where the internal diameter is said to be barely large enough to fit your hand in, maybe someone else here has more info on these. Hi Seamus! 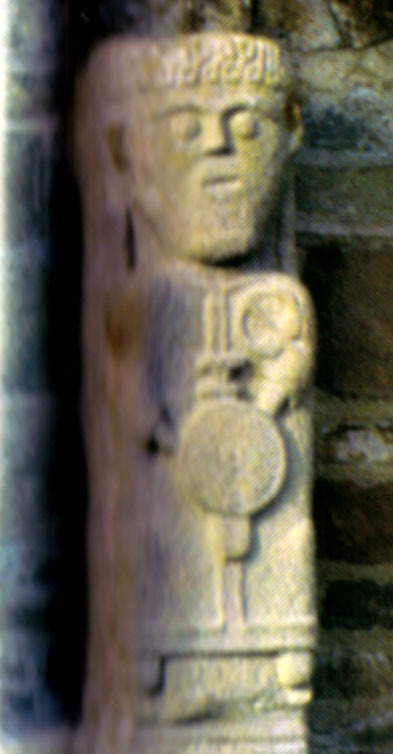 The shields depicted in iconography are indeed smaller than the Viking ones, round with a central boss. 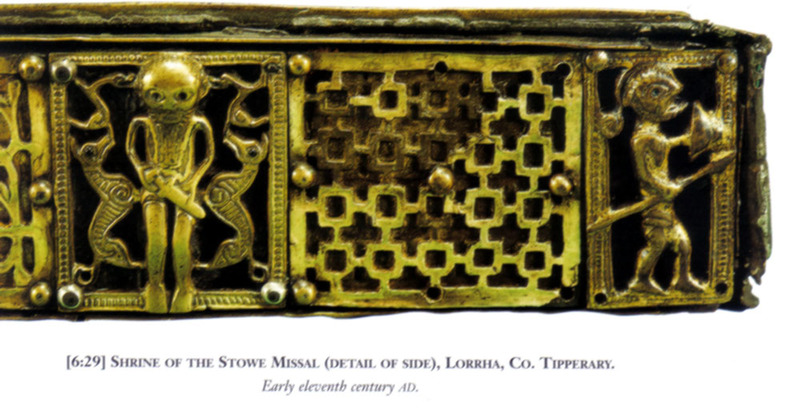 and here's a photo from the Dublin museum of a shield boss and a grip, description as follows: " Iron shield boss. Lagore, Co. Meath. W.4" "Copper alloy shield grip. River Bann, Co. Antrim/Derry 1939:63 "
plus there was a comment on the Irish shields underneath: "The copper alloy shield grip and iron boss although not found together, illustrate the small size of the Irish shield. These were in turn adopted by Viking settlers in the West and such small shields occur in Viking graves in Scotland and the Isle of Man". 'With its pronounced apex point, the Fishamble Street may also have some more local parallels, specifically a group of Irish shield bosses from crannog sites, notably Lagore, Co. Meath and Lough Faughan, Co. Down, most of which have similar apices. Although none of these come from securely dated contexts, all are probably earlier than the present example. 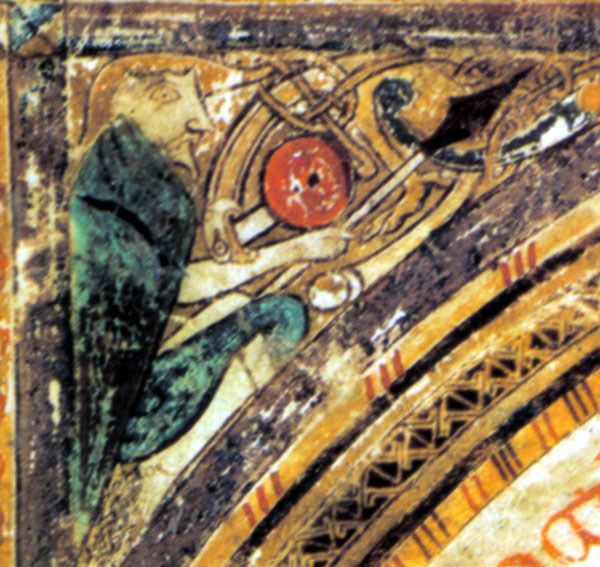 In addition, all known early medieval Irish shield bosses are very much smaller than the Fishamble Street boss, with diameters ranging from 7.7cm to 9.0cm, excluding the flange or rim. Small size is also characteristic of a group of conical shield bosses from the ninth-century 'Viking' burial complex at Kilmainham/Islandbridge, Dublin, which seem to have been strongly influenced by the small Irish shield bosses." Thank you so much for the wonderful pictures and descriptions! The book of Kells makes it look like the shields aren't decorated to much, maybe a layer of leather for added protection, which could have evolved in to the Targe latter on. I'm beginning to start the process of an early shield/buckler. One of the main questions I have is how would the be decorated after finished. 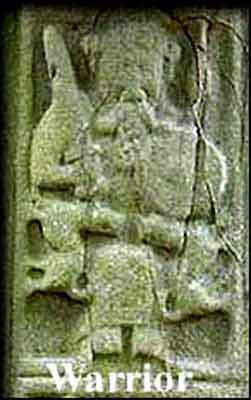 I've seen discussion around the Tain talking about "bright white shields", but would there have been designs or symbols on the shields and if so, do you think the designs would have been more like La Tene art work, or more like Pictish stuff? 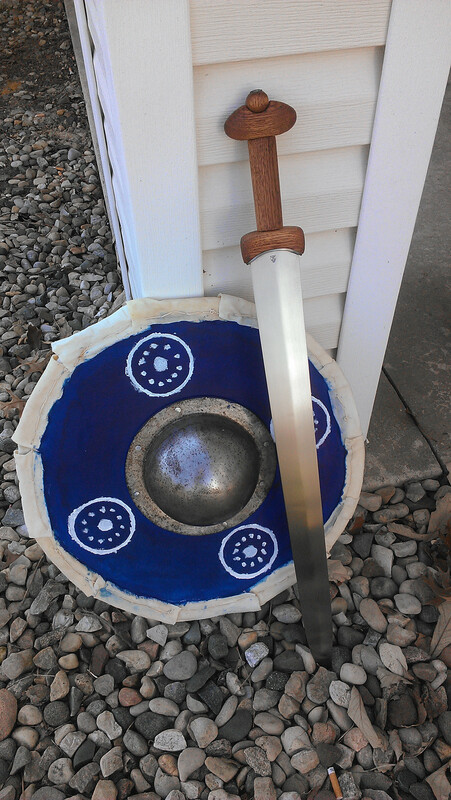 Seamus Mac Caba wrote: I'm beginning to start the process of an early shield/buckler. One of the main questions I have is how would the be decorated after finished. 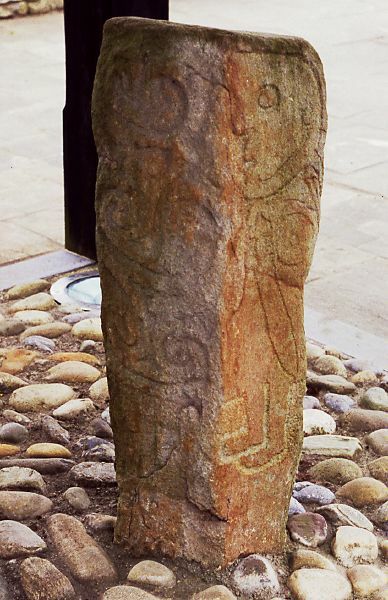 I've seen discussion around the Tain talking about "bright white shields", but would there have been designs or symbols on the shields and if so, do you think the designs would have been more like La Tene art work, or more like Pictish stuff? 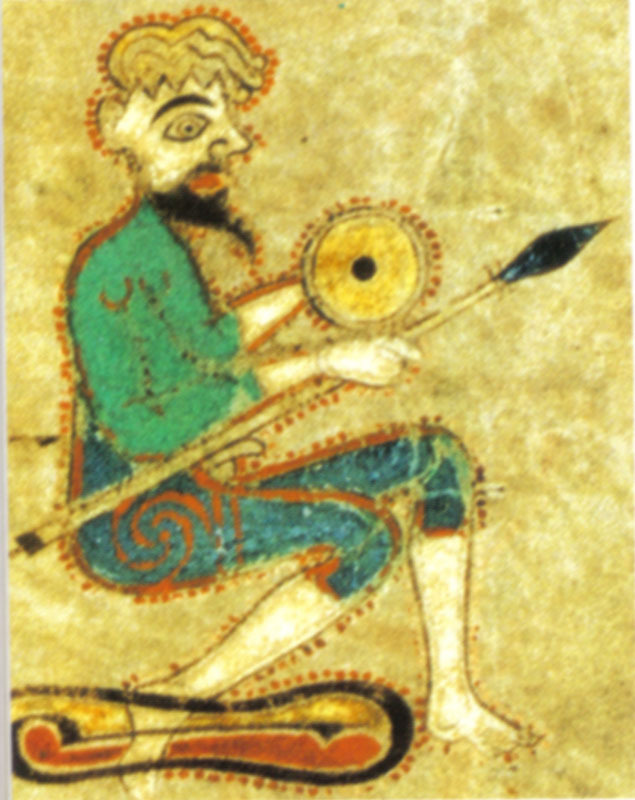 This might help, there is literary evidence from a bardic poem to Aodh O Conor, King of Connacht 1293-1309, it describes the king as clad in a cotton undershirt (cotun), a coat of mail (luireach) a pisane or collar of mail (coilear) reaching from shoulder to breast, golden spurs (spuir) and armed with a sword, a spear and a white shield, on which was depicted a dragon (or dragons) and golden branches. This is from Kathrine Simms, Warfare in the Medieval Gaelic Lordships page 105 and 106. Kevin, you beat me to it. I just read this article a few days ago and that description jumped right out at me! Always drives me mental to see huge 3ft+ shields being used in 10th-11th century Irish re-enactments. 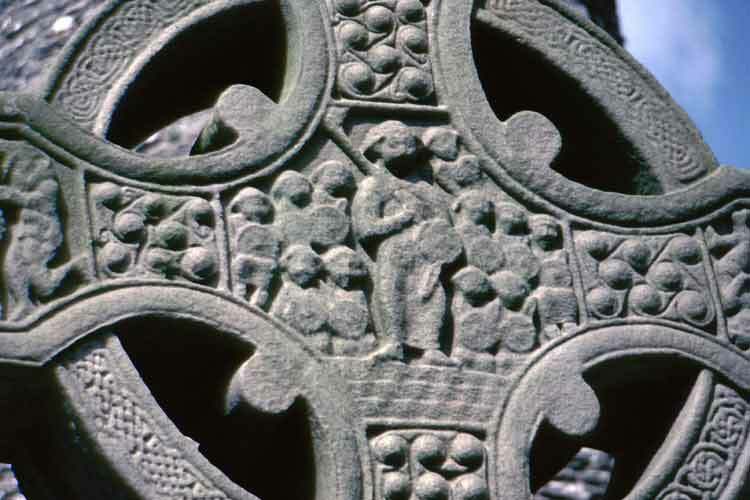 I've often heard people who were supposedly portraying Gaels justify their massive shields my citing Viking influence, when, in fact, the influence went the other way. But this is the case with a lot of reenactmentisms associated with that period. Books on Vikings are easier to buy than researching Gaelic kit. Well, I finally had time to make my shield. You can tell,it's the first one I've ever made. I never new stitching raw hide was so hard! It’s 18 inches diameter, faced with linen. With a red oak spine/handle. I wanted to use alder for the base, but I couldn't find any so I got a nice light oak instead. The sword was made by B. Stark from the Kelticos forum.